New MCM2627 316 Striped Green Eyeglasses 53/17/140 with Case & Cloth REF#081 ***PLEASE FOLLOW OUR STORE FOR NEW COLLECTIONS AND STYLES BEING ADDED DAILY*** To Follow our store please click here: https://www.ebay.com/str/eyewearyouwearoptics We strive for your 100% satisfaction! We have over 35 years experience serving the Optical industry. Visit our store to see all of the Designer Collections we carry, with over 30 brands you will find Eyeglasses and Sunglasses for Men, Women and Children. Model: 2859. Color: 10D Seafoam. Temple Size: 140 mm. Lens Size: 54 mm. Bridge Size: 17 mm. Model number 3252. Eye Size 52mm. ALWAYS 100% AUTHENTIC. Model number 3281. Eye Size 52mm. ALWAYS 100% AUTHENTIC. Lens color. EA3031 5227. EMPORIO ARMANI EYEGLASSES. 100% AUTHENTIC AND NEW. Included: Tom Ford case, cloth and paperwork may vary from picture. Style: Square. Material: Plastic. Model Number Made In: Italy. They have never been used but may have minor imperfections from storage, such as scuffs and scratches. MODEL: GU 2550 094. THE ITEM MUST BE IN ORIGINAL CONDITION. 100% Authentic. Original Case and Cloth. Model number 7243. Eye Size 52mm. ALWAYS 100% AUTHENTIC. Lens color. Chanel 3334 c.1553 Green and black striped. New 100% Authentic Eyeglasses. The size is: 54mm 16mm 140mm. Made in Italy. TOM FORD, Versace, Dolce & Gabbana, PRADA, COACH, Oakley, GUCCI, Ralph Lauren POLO, LACOSTE and Many more!! STYLE: Square. MODEL: CK5929. COLOR: 315 Striped Green. LENS COLOR: Demo Lens. Miu Miu VMU 07O U6S-1O1 Green on Gray with Silver and Tortoise Temples. New 100% Authentic Eyeglasses. The size is: 52mm 17mm 140mm. Engraved with a unique serial number from the manufacture to verify authenticity. Chanel 3335 c.1553 Green and black striped. 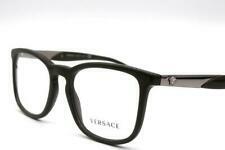 New 100% Authentic Eyeglasses. The size is: 52mm 18mm 140mm. Made in Italy. Model RX7043 5466. Color Demi Gloss Military. Lens Color Demo Lens. Temple Length 140 mm. Lens Socket Width 54 mm. Bridge Size 14 mm. Style Square. Prada VPR 14T VAS-1O1 Moss Green with Floral Interior. New 100% Authentic Eyeglasses. The size is: 52mm 19mm 145mm. Serial number etched on temple to verify authenticity. Made in Italy. Prada VPR 56S UF4-1O1 Shiny Green on Tortoise Temples. New 100% Authentic Eyeglasses. The size is: 53mm 17mm 140mm. Serial number etched on temple to verify authenticity. Made in Italy. Giorgio Armani 7012 Eyeglasses! style: 7012. You are looking at a new pair of Giorgio Armani eyeglasses. This is an authentic piece of eyewear acquired directly from the manufacturer. They are not to be used with demo lenses (if included). The ProDesign Denmark 1278 glasses have a stylish design and are part of the collection from ProDesign Denmark. You are looking at a pair of exclusive PRODESIGN DENMARK 1278 c. 9521 Eyeglasses. These ProDesign 1278 Essential glasses make a great addition to your outfit and you can be assured they are well-crafted for durable and daily use. Color: SGRN / SATIN GREEN. The various traits distinctively found adorned all throughout the Skechers SK 3049 are truly fascinating. The different options available for the Skechers SK 3049 exist to suite those looking for Eyeglasses specifically made for the right style and physical features. Faux semi-rimless center. Collection specific case included. Item must be unopened, unused and in original condition. New Authentic Versace MOD 1243 5183 Green Havana w/ Gold Eyeglasses 52/17/140mm with original Case and Cloth. We have over 35 years experience serving the Optical industry. These sunglasses are S A M P L E Units. Model:KABUKI 2. Color:3 Green Matte/Shiny (an olive gr een color). Model number 2178. Eye Size 55mm. ALWAYS 100% AUTHENTIC. E Y E G L A S S E S.